Everything!!! Very relaxing, extremely friendly and helpful staff. Very clean and extremely happy with our choice. Perfect place to stay! Good parking, beautiful property, brilliant pool, clean room with a nice balcony and a kitchenette that had it all, great WiFi... in short: loved the place, would recommend to anybody seeking a beautiful, peaceful place to stay. Staff were excellent, ... , and did I even mention the free snacks yet? 100/100! Thanks guys for making our stay one to remember! The entire experience was amazing. A short walk to center of time, quiet with a beautiful space. Maria and Stella were the perfect hostesses and always helped guide us in the right direction. We stayed in 4 hotels among the islands during our two week honeymoon and Kapetan Tasos was by far our favorite! We enjoyed our stay from the very first minute we entered the Suites. Staff is amazingly friendly and helpful. Building is new, very stylish and extremely clean! We also were surprised by complimentary wine and delicious pastry. The bed was the most comfortable one throughout all of our journeys in Greece, and we paid considerably more when we visited Santorini. The staff was incredibly helpful, happy, and kind. And the hotel itself was so lovely. They had delicious pastries available throughout the day for free. It's a short walk from the main area of Pollonia, but far enough that the hotel feels very private. My boyfriend and I stayed in the 1-bedroom suite and had a fantastic time. The space is equipped with a great kitchenette for all your cooking (or coffee making) needs. The Coco-Mat bed was really a treat. Warm lighting throughout makes the cool space really feel cozy. The restaurants of Pollonia are a really easy walk from the hotel and offer some really delicious local food. Definitely recommend. Our stay at Kapetan Tasos was by far the best place we stayed in in Greece. Our apartment had 5 balconies, the beds were fabulous, the kitchen was well stocked, everything was immaculate and the staff was so welcoming and helpful. I would recommend Kapetan Tasos to anyone! The rooms were excellent. The decoration and the facilities were perfect. The care for details were up to (may be even beyond) my expectations. The host and the stuffs are extremely nice, professional yet made us feel at home. There were some food for all the guests everyday and they were very good too (especially the rice pudding). The swimming pool and the gym were nice addition to all the other facilities. 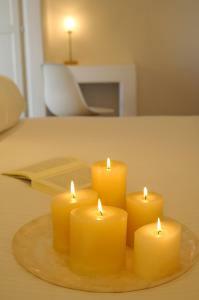 The rooms were regularly cleaned and all the amenities were refreshed as soon as something is used. The views from the rooms are very nice (mostly) and the table at the balcony makes a perfect spot for having breakfast. The staff was wonderful and very helpful. The accomodation was spacious and spotlessly cleaned every day, with a beautiful view to the sea. Lock in a great price for Kapetan Tasos Suites – rated 9.6 by recent guests! 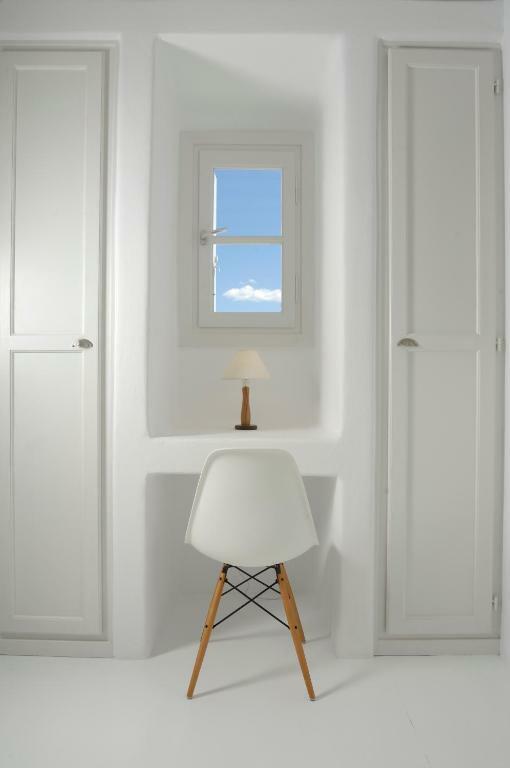 Located in the seaside village of Pollonia, Kapetan Tasos Suites offers stylish accommodations decorated with respect to the Cycladic style. It includes an indoor pool, a fitness room and a hot tub, and serves continental breakfast in the morning. 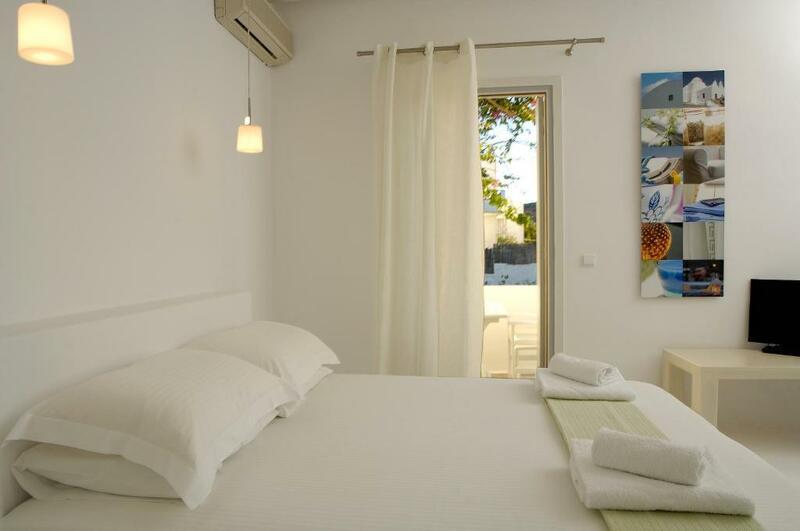 Tasos suites feature white furnishings with colorful details and open out to private balconies. They come with a mini fridge, electric kettle and a flat-screen, satellite TV. 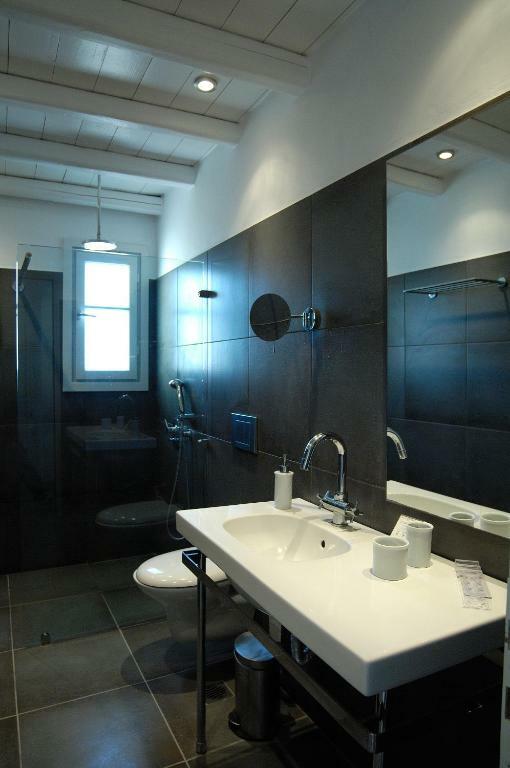 In the private bathroom, you will find free toiletries, bathrobes and slippers. 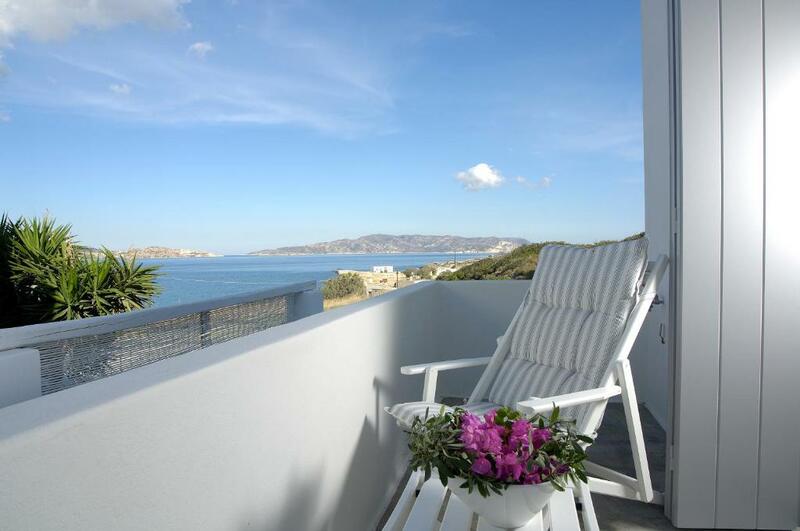 The port of Adamas is 6.2 mi away, while Plaka, the picturesque capital of Milos, is at 7.5 mi. Milos Airport is at 9.3 mi. Free Wi-Fi is available throughout and free private parking is possible. 뀐 Located in the top-rated area in Pollonia, this property has an excellent location score of 9.1! When would you like to stay at Kapetan Tasos Suites? Located on the ground or the first floor, this open-plan suite opens out to a private patio or veranda with sea or garden views. It includes Cocomat mattresses, Korres toiletries, flat-screen, satellite TV and a kitchenette. Free Wi-Fi is offered. 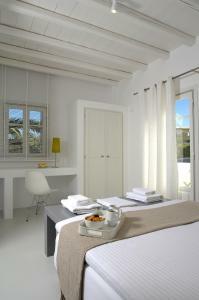 Two-room suite with Cocomat mattresses, Korres toiletries and flat-screen, satellite TV. It also includes a spacious seating area, a well-equipped kitchen and a bathroom with bathrobes and slippers and hairdryer. Free WiFi access is available. Located on the top floor, this spacious suite opens out to 3 large verandas and 2 balconies with panoramic views of Pollonia and the Aegean Sea. 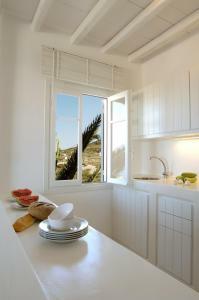 It consists of 2 bedrooms, a large living room and a fully equipped kitchen. Coco-mat mattresses and Korres toiletries are included. This suite can accommodate 4 people plus 1 in an extra bed. This suite has a balcony, soundproofing and mini-bar. I am a passionate traveler, so i can understand the needs of our guests. House Rules Kapetan Tasos Suites takes special requests – add in the next step! Kapetan Tasos Suites accepts these cards and reserves the right to temporarily hold an amount prior to arrival. Well, there is just one thing that bothered us. Milos is still developing thus the first room where we stayed, although, extremely beautiful and cozy, faced the main road and another property nearby that was under construction. By the second day the noise was just annoying. So we asked to move to a different room and fortunately there was a room available. In retrospect, it was a bit of nuisance rather than some thing we didn't like. If however, we had to stay in the same room for 9 days, it could have been a problem. I gave a lower rating for location based on this experience. The baked treats were delicious and especially nice that they were available all day! The staff was awesome, Stella went above and beyond to help us retrieve a lost cell phone on the plane. The pool was also a treat, can't wait to come back! This place definitely exceeded our expectations. Stylish room, good location, friendly staff. The owner of the hotel was very welcoming and helpful and her freshly made cakes each day made our experience even better. Hot water was a little hit and miss. 2 bdrm apartment was large and spacious. Short walk down to Pollonia with loads of cafes and restaurants. Home baked delicacies provided each day. Staff were very friendly and helpful. Nothing at all. Perhaps better signs from the main road and maybe a buggy/shuttle to the village but this is nit picking. This is a 5 star spot to me. I visited the Greek islands for 2 weeks on holiday. By far, this is the best place i stayed at. Such a wonderful cute little spot. Just a short 10 min walk to the village with great privacy and peace. Great views of the water (not all rooms) and i had a little patio for eating breakfast or having an evening drink. Really quaint place. Room was super comfy - the bed and pillows were wonderful. Will definitely come back here. Friendly host. Super friendly staff & huge room. We enjoyed the warm and generous hospitality. The place was beautiful. We arrived at Kapetan Tasos to the warmest welcome by the two reception girls. They showed us to our beautiful apartment which had two bathrooms, Korres products, beautiful Coco Mat bed and pillow menu, a perfectly sized kitchenette with a fridge containing some local treats for our consumption (homemade raspberry jam, white wine, water, raki, ouzo) and fresh biscuits and Nespresso coffee pods to make ourselves at home. From the very first step in, with the spaciousness and breezy light that filtered through, it felt like a home. This was further accentuated by the midday buffet table full of sweet and savoury homemade pastries made by the hotel owner every day. There were croissants, yoghurt cake, baklava, chocolate cake, spanakopita, tiropita - plenty and more and all so tasty. The perfect treat to come back to after an insatiable appetite from the sea. The location was also delightful. Following this little bush path for 2 minutes, you reach a beautiful private beach of Pollonia. And the Pollonia shops and restaurants are only a 5 minute walk away. This is also where the bus stop is. We also highly recommend booking the Thalassitra boat tour around Milos! A truly unforgettable experience. 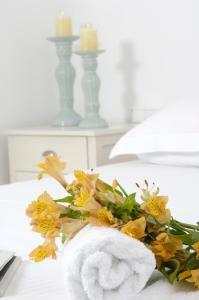 The staff were most pleasant as well and really made our stay feel so homely. If I return to Milos, I will be sure to stay here again! Exceptional service..felt truly at home. Room was Uber clean and all the complimentary snacks and refreshments were an unexpected touch but much appreciated. Recommend it 100%! Everything is perfect! The staff are so nice, the place is clean and near from the polonia’s downtown! Me and my friend loved the moment we spend there ! It was amazing!! Cannot recommend more. Rooms are nice and big as well as bathrooms. Everyday they will put different tasty treats on the ground floor which was such a nice touch. It is close to a beach, pharmacy and tavernas, however not too close to be disturbed by the sounds from the road. In our room the balcony was a bit small for the furniture there was, and it was difficult to get to the shadow while eating lunch or breakfast. The pool is really cold, so it should be mentioned somewhere. It was great to be really next to the beach. Service was top level! We had a beautiful room and everything is super clean.